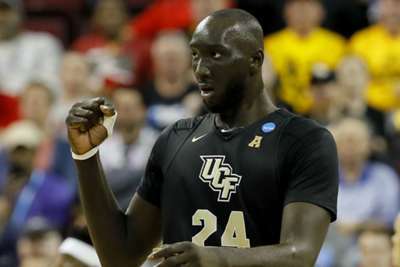 When you are as tall as Tacko Fall, you can afford to have confidence of avoiding being dunked on, and the giant UCF center insists he will not become part of Zion Williamson's ever burgeoning highlight reel. Duke star Williamson, a near-certainty to be the number one pick in this year's NBA draft, has made a name for himself with his monstrous dunks and ability to block most shots that come his way. He will go up against Fall, the tallest player in college basketball at 7ft 6in, when Duke take on UCF in the second round of the NCAA Tournament on Sunday. And fall vowed that the Blue Devils' superstar freshman will not have the opportunity to dunk on him. "It's very hard [to dunk on me]," Fall told NCAA.com. "I mean, I won't allow it. I won't allow it. I won't allow him putting me on one of his highlight tapes." "He's someone, pretty much, we've never seen in weight, size. He's immense, and he's so quick," Fall said of Williamson, who is 6ft 7in and weighs 284 pounds. "But the coaches are going to have a great game plan, especially Coach [Johnny] Dawkins, I feel like, because he played for Duke, so he's going to have to help us out a lot." Both teams advanced from the first round of the tournament on Friday. Top-seeded Duke beat North Dakota State 85-62, and UCF overcame eighth-seeded VCU, 73-58.